I think sometimes we dismiss parsley, which is classified as a herb, as something only sprinkled on top of a dish and used as a garnish. I have only ever used flat leaf parsley (aka Italian, continental) in green smoothies- I think it has more flavour and is leafier of course. It looks a bit like coriander (cilantro) so don’t buy accidently like I have once in a rush-I have never liked fresh coriander. Raw parsley is incredibly high in Vitamin K-1366% of your RDA – this increases your bone mass amongst other things. It’s also high in C-we often don’t think of green food being high in C only the red and orange foods. Of course there’s lots of iron too and parsley is rich in anti-oxidants and minerals like potassium, calcium, manganese and magnesium like most greens. I love parsley in green smoothies because it is the only way you are going to be able to eat a whole bunch of it raw! Before green smoothies I would usually chop up a bunch and put in vege/bean soup with baby spinach at the end of cooking then let it sit in the soup and steam. My smoothie today had a bunch of flat leaf parsley/ spinach, mango and frozen pureed peach-I always buy too many peaches at the Farmer’s Market and of course they all ripen at once-when you puree fruit in the blender then freeze it the blending aerates it and becomes almost like sorbet. I also added lime juice and ginger for flavour and a tablespoon of ground chia and a handful of koji berries. 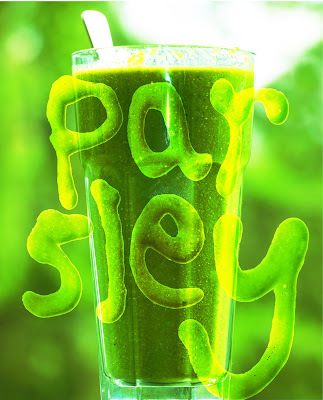 Parsley is the bomb, I include it in almost every one of my green juice recipes. I’m going to have to try it in a smoothie. Nice post. I have to agree with Dan. I was incredibly skeptical about putting parsley in my smoothie, but because I was making a dish before hand and cut off too much parsley, I was kind of forced to. I’m drinking it now and it is very good. I use the stalks too so nothing is wasted-yum! I drink a parsley fresh pineapple smoothie about 4 days a week VERY refreshing! Yum delicious. Love pineapple with lime ( add the whole lime with the skin) lemon juice and coconut oil too.